Could you imagine driving along then all of a sudden the see the largest most gigantic cyclist statue ever? That happened to us this summer while vacationing in Southern Wisconsin. We were down by Sparta and heard about it at the gas station. We just had to go by and see it. I’ve know about it but had never seen it before. So we drove on down the street and there it was. You couldn’t miss it for the world. It is ginormous! 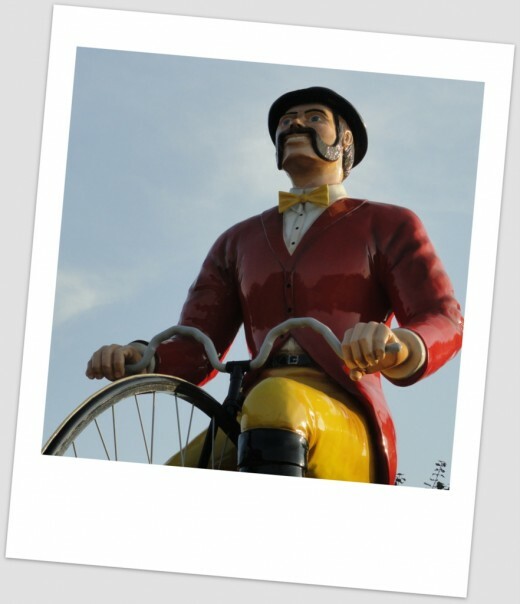 You’ll find this Big Ben Cyclist statue in downtown Sparta, Wisconsin. 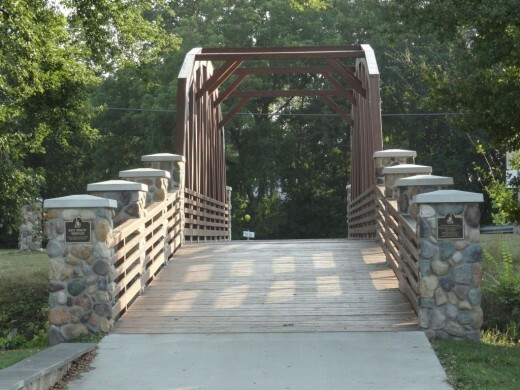 Located on Hwy 16 and Water St at the end of the Elroy-Sparta Bike Trail. The bike trail that it represents is 32 miles long with three railroad tunnels. I’ve been on parts of the trail in my high school days. Big Ben is his name and he’s and old fashioned cyclist from the Gay Nineties era. His sits atop a Victorian cycle. The statue is 32 ft high. Its very impressive! Sparta is considered the Bicycle Capital of America. So it makes sense for this statue to represent its town and bike trail. You don’t want to miss seeing this if you are in the area. Let’s cross the bridge to see the most exciting largest bicyclist ever. There HE is up so high! He goes by Big Ben and he is from the Gay Nineties era which refers to the 1890s but used in the 1920s when a artist Richard V. Culter first released drawings titled Gay Nineties. 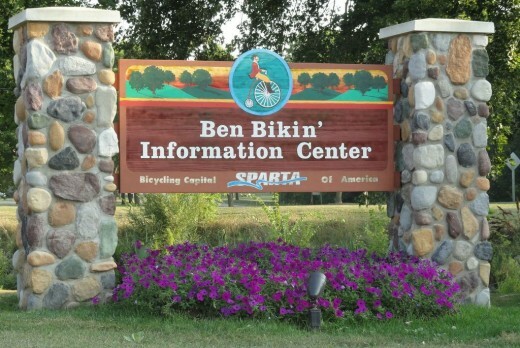 Ben is the worlds largest bicyclist located in downtown Sparta, Wisconsin at the end of the Elroy-Sparta State Bike Trail. Ben sits 32-foot high and is on a one wheel bicycle. 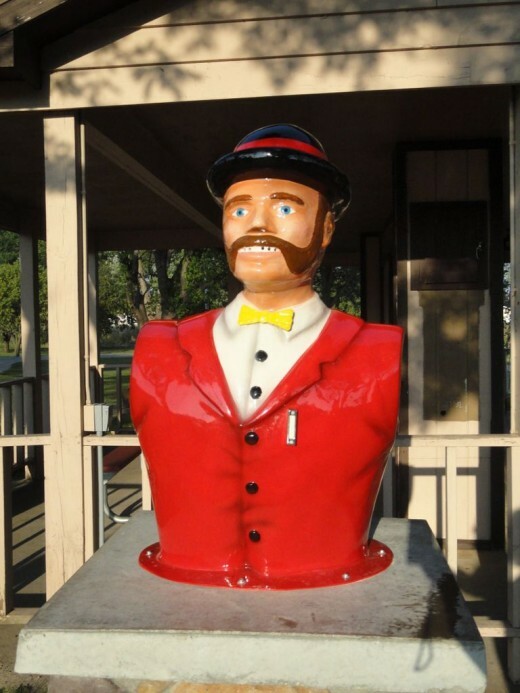 The statue was built in the 1990s by a local fiberglass company called the F.A.S.T Corporation. Sparta is the Bicycling Capital of America. Ben represents the bike trail where a old abandoned railroad bed use to be. When first built, the base he sat on talked – since then has been replaced with cement stone base. Ben still talks and tells you about the trail and Sparta attractions in another statue which you see below. Just press the button and he talks. It’s really cool. I thought it was a water fountain at first but then discovered it just talked. The bridge we took a walk over to get to Ben Bikin was built in 2011. This serves as a pedestrian and snowmobile bridge. It crosses a stream and is a nice easier access to the park and trail.